The project will duplicate 1.75km the Bruce Highway between the Rockhampton – Yeppoon Road intersection and Rachel Drive intersection through the northern Rockhampton suburb of Parkhurst. It will deliver a four lane urban roadway, including a new 72 metre reinforced concrete bridge over Limestone Creek and capacity upgrades to the Yeppoon Road, Boundary Road South, Boundary Road North and Stirling Drive intersections. 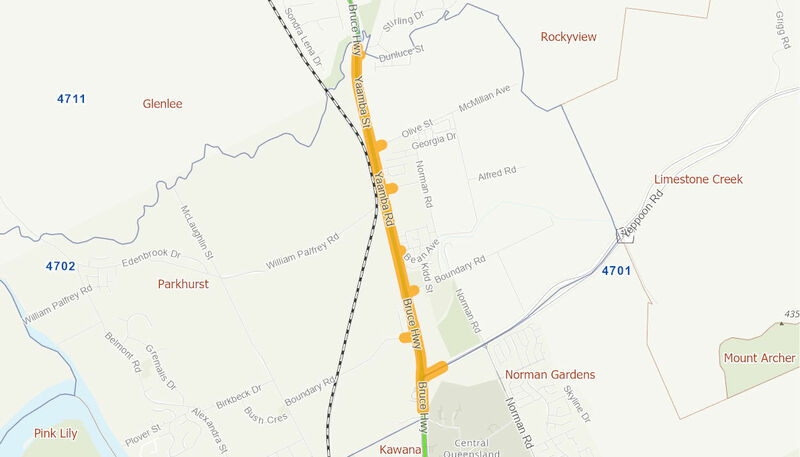 The project will increase safety and reduce travel times by increasing the capacity on this section of the Bruce Highway to four lanes which will deliver improved traffic conditions for road users. The Australian Government has committmed up to $96.8 million to the project, in parternship funding with the Queensland Government. Construction commenced in early 2019 and is expected to be completed by mid 2020, weather permitting.